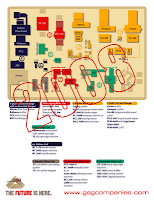 In 2008, GSG arranged the ISPA EXPO booth in a cell manufacturing configuration. This was very appealing for mattress manufacturers seeing which machines work together to form each work cell. Cell manufacturing is gaining popularity in markets beyond bedding because it allows for greater product diversity and better lean practices that eliminate waste. In response to this growing popularity, GSG has developed over a dozen new machines for work cells in various mattress plant functions. Visit GSG in booth 2625 at ISPA Expo to see the latest additions to our work cell machinery collections.